This fantastic new 14-page calendar is laid out in a 30 x 60cm format, with huge high-quality photos taken by some of the world's current best flight photographers. 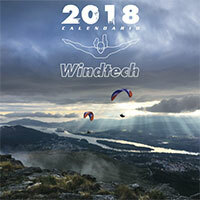 The full Windtech line is showcased in this new calendar, including the new Capri and Bios, seen at various picturesque flying areas around the world, including Spain, Portugal, France, Indonesia and so on. Each month has one beautiful photos representing the time of year. Get our new calendar now from your local dealer, or by emailing us directly.